On Thursday night as part of a new global concept, Miller Genuine Draft brought to life a ‘space’ where cultural trends and creativity combined to create the exceptional. Five Australian designers from the fashion, technology, art, music and design worlds came together to create one incredible creative hub in Melbourne’s Windsor. 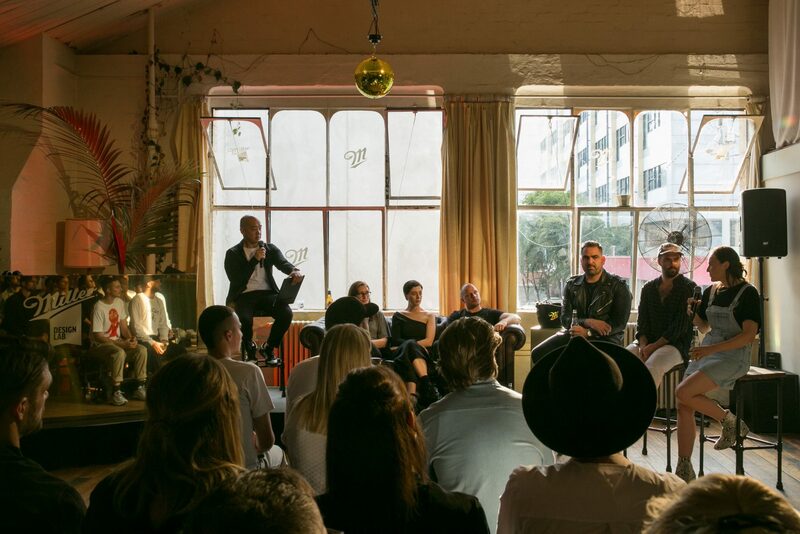 The night was enjoyed by over 250 people including notable Melbourne personalities and creative talent. Hanoi Hannah and Tokyo Tina provided sumptuous offerings with guests enjoying Miller’s genuine draft beer and the specially crafted cocktail, the ‘Lagerita’. The well-attended design panel hosted by Jeff Staple and Miller Design Lab artists provided an insight into the industry and the inspiration behind the art featured at the pop-up space. Curated by world renowned designer and creative enigma, Jeff Staple, ‘Miller Design Lab’ is inspired by the theme, ‘gold is the new black’ and is a truly creative campaign where people can enjoy art, culture, music and the refreshing taste of Miller Genuine Draft while they engage with the brand in a new and innovative way. More than a physical space, Miller Design Lab caters to the audience’s desire to stay one step ahead, to embrace the trends that define this moment and interact with original content and experiences that reflect their appetite for the new and exciting. Over the next ten days the public can enjoy the Miller Design Lab space with designers including light sculptor, Meagan Streader, street artist, Buff Diss, Pitch Studios Founder & Creative Director, Christie Morgan and textile creators, DREAMCATCHERSDREAMTIME X Think Positive Prints continuing to lend their creative talent to the Miller Design Lab each hosting their own launch night. All five designers have created an immersive concept for guests within the SoHigh gallery space which is a reflection of the ‘gold is the new black’ theme and an engaging expression of their interpretation of exceptional experiences. These next five events will also see an exciting line-up of experiences for guests including renowned DJ and musical sets and sideline events hosted at the Miller Design Lab partner and after party venue, The Emerson Rooftop Bar and Club. Venue: SoHigh Gallery, 143a Chapel Street, Windsor VIC 3181.